LOS ANGELES, CA.- The 17th Annual LA Art Show: Modern & Contemporary will feature the California debut of new works by artists Damien Hirst and photographer David Bailey. Locally accessible for the first time, new works by Hirst include ‘The Souls’ series of shimmering foil-­‐block butterfly prints and gold foil block skulls ‘Death or Glory.’ Bailey will exhibit new works of still lives, fashion images, and portraits. Both artists are represented by Paul Stolper Contemporary Art Gallery from London, UK. Additional gallery highlights include a collection of works by one of California’s most significant contemporary artists, Tom Holland. Holland’s work will be presented by David Richards Contemporary from Santa Fe, NM and will feature pieces from the 1960s, a period in which Holland’s work transitioned from traditional painting on a two-­‐dimensional plane to more literal, three-­‐dimensional constructions. Tom Holland’s work is in the collections of many major museums in the United States, including the Museum of Modern Art in New York City, the Guggenheim Museum, the Whitney Museum, the Los Angeles County Museum, the San Francisco Museum of Modern Art and the Walker Art Center in Minneapolis. Pan American Art Projects from Miami, FL will feature Oakland-­‐based artist Tracey Snelling, based on her experiences in China and the United States, creating a cultural dialogue between the two. Jack Rutberg Fine Arts from Los Angeles, CA will showcase a variety of artists including Jordi Alcaraz, Karel Appel, Norman Bluhm, Hans Burkhardt, George Condo, Clarie Falkenstein, Patrick Graham, George Herms, Pablo Picasso, Ruth Weisberg, Jerome Witkin, and Francisco Zuniga. The LA Art Show: Modern & Contemporary will also feature select Chinese galleries that have never exhibited in the United States. Chinese artists include Im Jari and Zhang Xianyong, represented by FQ Projects from Shanghai; China, Jiang Peng Yi, represented by ME Photo Gallery from Beijing; China, and woodblock prints by Liu Qingyuan from CM2 Gallery, from Los Angeles. The LA Art Show: Modern & Contemporary is committed to showing the highest quality works ranging from Jamie Reid, Ed Ruscha, Armando Romero, David Hockney, Roy Lichtenstein, Arshile Gorky, Jim Dine, Andy Warhol, Fernando Botero, and others. Designed to showcase cutting-­‐edge artwork as well as forward thinking artists, this show will feature performance pieces, mixed media installations, video installations, contemporary paintings, a sculpture garden, and a series of curated special exhibitions. Graphito. Graphito will paint on-­‐site throughout the 4-­‐day show. The LA Art Show: Modern & Contemporary Symposia Series will focus on the confluence of art & design with interactive discussions led by Milton Esterow, Suzanne Lacy, and a book signing by renowned artist Hunt Slonem. Additional programming for the LA Art Show: Modern & Contemporary includes Project Spaces which offers solo artist exhibition space to select participating galleries. Galleries invited to participate for project spaces at the 2012 show include Boma Modern from Santa Fe, NM; Davidson Contemporary from Seattle, WA; and The Master League of Arts from Moscow, Russia. The LA Art Show: Modern & Contemporary will kick off with a high-­‐profile Opening Night Premiere Party on Wednesday, January 18 at the Los Angeles Convention Center. Hosted by actor and Art of Elysium supporter David Arquette, proceeds from the Opening Night Premiere Party will enable Preview beneficiaries The Art of Elysium to expand its program to bring arts to critically ill hospitalized children and increase substantially the number of school children who visit the Getty through the J. Paul Getty Museum’s Education Department program for Title One School visits. With more than 5,000 patrons in 2011, the Opening Night Premiere Party has consistently drawn attendees who love art, including museum patrons, political dignitaries, collectors, celebrities, and supporters of arts education. 2011 LA Art Show: Modern & Contemporary attendees included: Halle Berry, Olivier Martinez, Finola Hughes, Russell Young, Shepard Fairey, Kat von D., Cheech Marin, Councilman Tom LaBonge, Chinese Consul General Qiu Shaofang, Executive Director of the DCA, Olga Garay, and Gayle and Ed Roski. With live performances and curated exhibitions, the 2012 Opening Night Premiere Party promises to be more exciting and encompassing. Food Network's new show Rachael vs. Guy Celebrity Cook-Off premieres January 1st. Celebs such as Cheech Marin and Lou Diamond Philips compete. 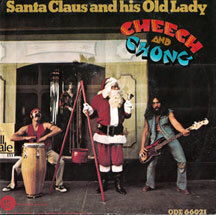 This is your last chance to pick up the Cheech and Chong Christmas Head Lights. They are no longer manufactured because of a licensing disagreement between the manufacturer and Cheech and Chong's lawyers. This weekend only, there's no worldwide shipping and handling on anything plus you get a free shirt with every order of $25 or more. Offer expires Tuesday, December 20th at 12AM New York. Cheech Marin brings his collection of small print works by Chicano artists to the Museum of Monterey. The wonderful museum film crew, consisting of Fred Nelson and Bert Rankin, was there to capture the opening. 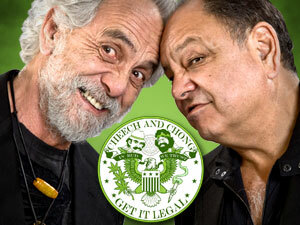 Rob Schneider's new sitcom, Rob!, co-stars Cheech Marin and premiers January 12th. Cheech Marin's CHICANITAS collection is coming to The Museum of Monterey! Cheech Marin will be at the Museum on December 10 for the show's opening reception! Miley Cyrus Pot Sketch on SNL...You're like a funny little Cheech Marin. Last night, Saturday Night Live had a Miley Cyrus Show sketch. In it, 'Billy Ray Cyrus' says she's like a "funny little Cheech Marin."